The EU27 are holding together throughout the twists and turns of Brexit. This is simply because it is in their interest to do so, writes Caroline de Gruyter (European Council on Foreign Relations). This is Brexit for many Europeans: entertainment. It can be much more exciting than football, soap operas, or talk shows. There is a parallel with the Greek crisis. At the time, some people could not get enough of parliamentary debates in Athens. They watched them on television like addicts. Crooked politicians dismantling each other’s lies; a prime minister changing opinion and strategy every week. All the Shakespearean characters were there. We all had strong opinions. Which, of course, were self-indulgent: thank God this happened to the Greeks and not to us. With all due respect to those disadvantaged by Brexit or the euro crisis – what is fascinating is that it does not really matter what happens in Athens or London. It is mainly theatre. Perhaps this is why the British let themselves go to such an extent, even with the whole world watching: they know that what will happen is inconsequential. UK politicians can make as many U-turns and pirouettes as they fancy, because ultimately they know they are a country leaving a huge bloc of ever-quibbling member states that, however stubbornly, all stick to one common goal: to protect European institutions and EU rules from harm. This is why it is Brussels and not London that, at every step along the Brexit road, has determined the conditions. The latest example of this is the 27 European leaders rejecting the British prime minister’s request for an extension of the Brexit deadline of 30 June. By means of reply they imposed their own timeline, which she had to accept. Of course, the British do have choices, but only within a bandwidth defined by the 27. The EU politely receives and considers every infeasible plan coming from London, like a ‘benevolent hegemon’ careful not to step on its small neighbour’s toes. But if such a plan hinders the EU, the 27 reject it. This is what happened recently with the bizarre ‘honesty boxes’ that the UK government proposed to put along the Irish border in case of no deal. Traders were supposed to declare their own goods, on a voluntary basis, in those boxes. This, London argued, would make border checks in Ireland unnecessary. But it seemed that EU officials had read the extensive literature about smuggling on the British Isles better than some of their British colleagues. The EU has to protect its single market. If not, it will collapse. So the 27 did not even consider the proposal. So all in all, the Brexit story tells us a lot about the EU. Predictions continue that the EU will implode, explode, or otherwise disappear – but the reverse seems to be happening. It is becoming stronger. This is not because it has dictatorial tendencies or everyone has suddenly become Europhile, but for the simple reason that 27 member states have an interest in this being so. For this reason they survived the euro crisis, the migration crisis, and Brexit so far. To be sure, the EU has major problems, but its member know too that the international set-up has changed. They foresee a looming battle between superpowers. The United States, China, and Russia are all circling the EU and European governments are starting to fear for the future of their peace, their riches, and their way of life. This is why France and Germany are now working on what Constanze Stelzenmüller of the Brookings Institution calls “a fourth story for Europe”. She writes: “The first story was about peace; the second, prosperity; and the third, democratic transformation. This fourth story is about the protection of what Macron terms “civilization” and [CDU-party leader] Kramp-Karrenbauer calls the “European way of life”: representative democracy, the rule of law, individual freedom and a social market economy.” In short, this is about preserving the achievements of three-quarters of a century on a continent previously ridden by war. This explains why EU countries are trying to strengthen the eurozone,and are planning to set up a European Security Council and introduce better monitoring of external borders. The prerequisites to make the “fourth” story successful are already built into the federal structure of the EU. Its backbone are the institutions and the common rules. No one fancies exits any more. Even the staunchest Eurosceptics have changed their minds. Now they want to be elected to the European Parliament, send commissioners to Brussels, and fill EU courts with judges. They have understood that if you cannot abandon or escape European institutions, you must try to control them. 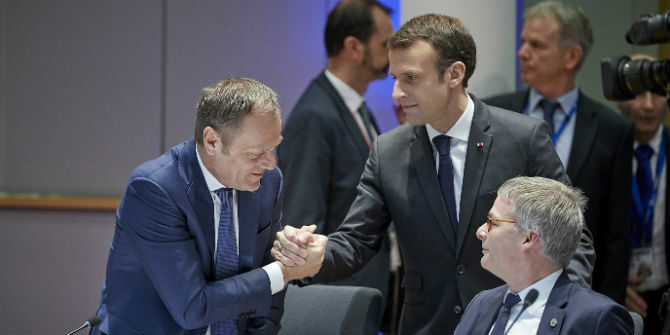 They have finally grasped something that the Swiss and Norwegians have experienced for a long time but the Brexiteers, absorbed with themselves and their jolly plans, failed to see: European institutions are solid and powerful, shaping events and structures far beyond the EU. This post represents the views of the author and not those of the Brexit blog, nor the LSE. It first appeared at the European Council on Foreign Relations blog. Caroline de Gruyter is a Council Member of the European Council on Foreign Relations and an author and journalist based in Oslo.